The hardest thing about eating gluten free is the bread. There is no doubt about that. It’s not just the sandwich bread but the hamburger buns and hot dog buns. I’ve bought Kinnikinnick hamburger buns to take to a family BBQ so that the kid’s meal would look just like everyone elses. The buns however were more than a dollar a piece and were dry and brittle. Dry, as in, get stuck in your throat. They were terribly dry and mealy. We all ended up pushing the buns to the sides of our plates and eating our burgers without the buns. I have got the gf bread thing figured out and I am sure that my regular bread recipe would make great buns. However, that recipe is yeast based and would require rise time and more work than I am usually up for on burger night. 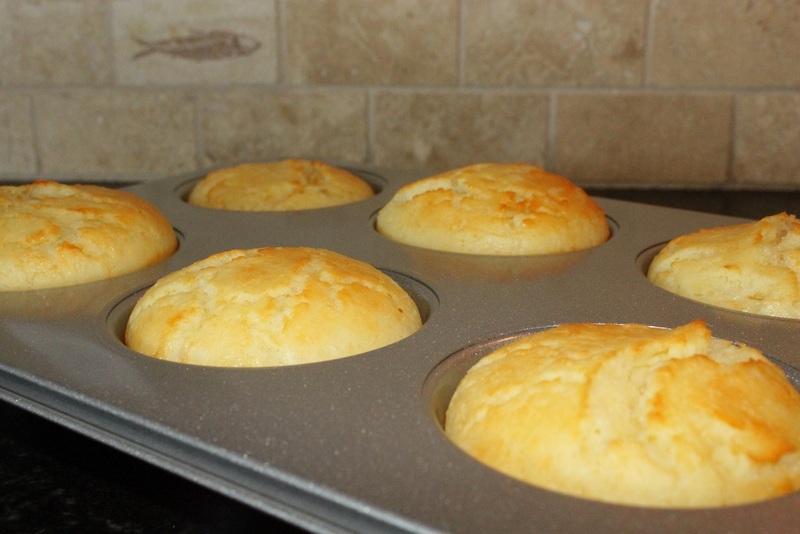 I also have an amazing recipe for cheese buns which are a soft and delicate, decadent dinner roll. We had been missing hamburger buns. Burgers without a bun just aren’t the same. I have to give credit to my husband for this idea. He suggested using the cheesy dinner rolls as hamburger buns. The recipe as it was wouldn’t be sturdy enough to hold a hamburger and all the toppings so I made some adjustments. They turned out to be fantastic. However, if you don’t love cheese, move along. You won’t like these hamburger buns if you don’t love cheese. They are moist, tender, cheesy, and flavorful. Best yet, for me anyway, was the ease of preparation. No yeast means no wait. Just mix it all up, divide, roll into balls and bake. These are so good if I were to be able to choose between these and a wheat bun, I would choose these cheese buns. How do you think these would work baked in a muffin-top pan? Any ideas on adjusting baking time? Thanks! I think a muffin top pan would work great. I think I am going to try this this week without a muffin pan at all and see if they can hold up that way. I am not sure about baking time but I bet it would be close to the same. Maybe check on them a couple of minutes early. If the edges are starting to brown they are probably done. I made these without a muffin tin. I just made little balls of dough and put them of the cookie sheet lined with parchment paper. It worked perfectly. They end up shaped just like the wheat ones you buy in the store. I’ll do them this way from now on. Will these work with veggy cheese ? I’m dairy free as well as GF but LOOOVE cheese. This makes my day. Thanks for letting me know you tried the recipe and liked it. We love these too. Even if we could have wheat buns I think we would rather have these. Have youi tried freezing them? I wonder if that would work well. That way you could make a bunch and reheat as needed so you could make burger night a quick meal. 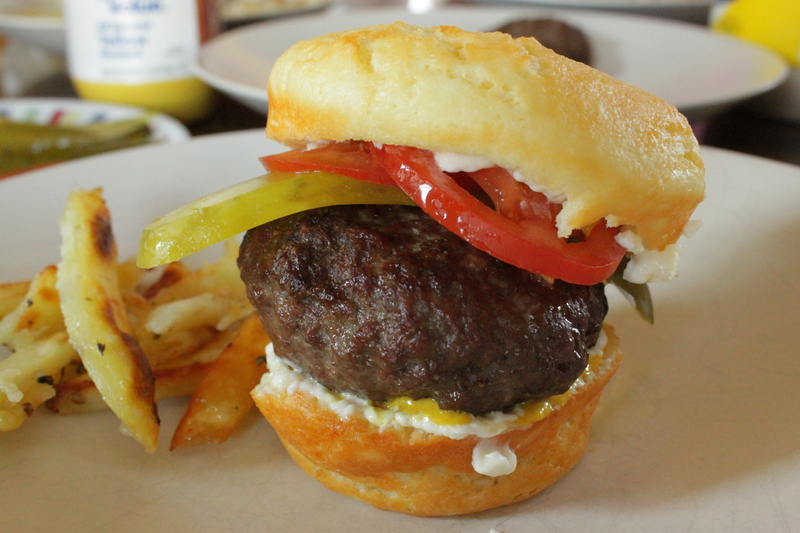 One quick question, though… when I followed the recipe, my bun didn’t come out as moist as the picture above. It tasted real good, and my husband said for a GF recipe it was surprisingly tasty. I give you that credit. The only change that I made to the recipe was using cheddar cheese instead of mozzarella just because I ran out of mozz at the time. Does it make the huge difference? what can I do differently to make it as moist as the picture above? Simply, mine turned out to be a very delicious biscuit. Help? Please…? I’ve done it with cheddar and it was really good that way too so no I don’t think it’s the type of cheese unless it was a dry cheddar???. Maybe try cutting back on the rice flour. I wonder if this is like my bread recipe in that the outcome depends on where you are. Maybe your rice flour is slightly coarser than mine is. How did the dough feel. Was it soft or stiff? there was not much of dough per se. I had the feeling that it was too dry. But, I guess it is because of cheese that I could form small dough in my hands and bake them. It was all crumbly. Taste was great, though. I loved the recipe, and I already shared it with one of parents at my son’s school. 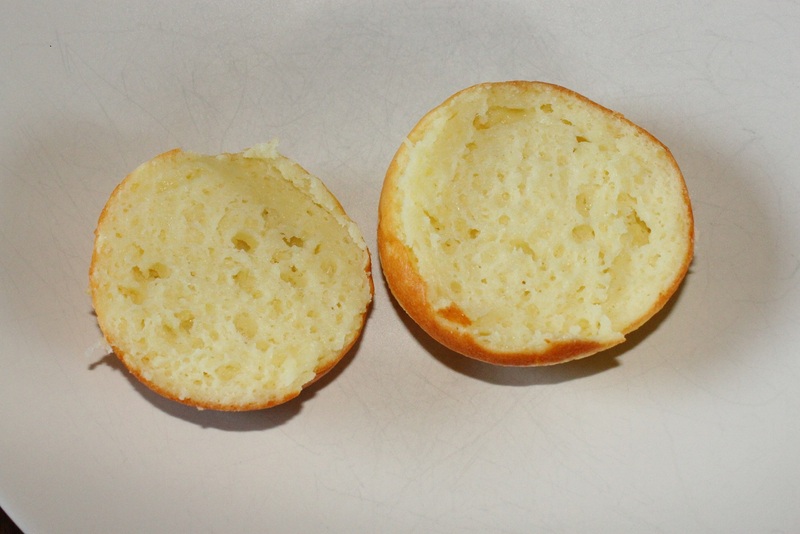 My son’s teacher tasted the biscuit-like bun and loved it saying that it would make a delicious well… BISCUIT! 🙂 She couldn’t believe it was GF recipe. Rice flour was very fine. So did Tapioca flour. Only if I could make it as moist and soft as yours on the pic, I think it’d be fantastic. You have no idea how excited I was to find this recipe and your blog full of great GF recipes. I am blogging on Korean website as well–I am bi-lingual, and if you don’t mind I’d like to share on my blog. Of course, I will post it as “cited” and will indicate the source clearly. Yup, I’d bet too much rice flour. It should make a dough that looks and feels much like wheat dough would. Not sticky, soft, uniform, rolls easily into balls…. Was it the pre-grated cheese? Sometimes that stuff is really dry. I grate my own and it ends up completely incorporated. By that I mean you can’t see shreds of cheese either. Did you see the original recipe? The one I use as a dinner roll? It does not have rice flour in it only tapioca. They are to die for!! They are light, airy, fluffy, tender. Better than any wheat roll I have EVER had. Now all this talk of these rolls….. I’m starving. I’m so glad you are enjoying the recipes. Hearing that makes the time I put into this blog (which has been minimal lately 🙂 ) worth while. I’d love it if you would link to my blog. Now I’ve got to go check out yours. I just noticed you didn’t link up your blog with your comment. What’s your blogs address? I didn’t blog about the recipe yet. Since I found your recipes, I have been kinda busy trying them! 🙂 My picky 7-yo boy LOVES the cheese bun and he wanted me to make a ham sandwich for his lunch tomorrow! This is HUGE! Thank you very much! My current blog is all written in Korean. And, yet, once I finish blogging about this GF recipes I will link my blog so you can check as well. I am also currently working on wordpress blog. My korean blog is indyandy.tistory.com. You can still see some pics of my boy and his therapy/wild guard dog. 🙂 Thanks again! I’m not even sure how I stumbled across this post, but I’m so glad I did. After trying many different dry, tasteless GF sandwich buns, I am excited to try these! I’m making chicken BBQ’s for dinner, and we’ll be having these buns. Although I’m using a mixture of provolone & mozzarella, since it’s what I have on hand. Oooo, that sounds good, both the cheese mix and having it with BBQ chicken. I hope it turns out as well for you as it does for me. Let me know how it goes! (A previous commenter noted that when she tried it the dough was crumbly and dry. If that is the case try adding a tablespoon of half and half or cream. The dough should be soft like wheat dough, not sticky and not dry.) Good luck! They are ready to go into the oven. I did have to add some liquid to the mix. As I was making them, I thought of a couple things that might make a difference. 1. Are you packing the cheese or is it a “loose” 4 cups of cheese? 2. What size are your eggs? So – I didn’t have any half and half, but I do have whole, creamline milk, so I added about 1/4 cup to the mix, and I have a biscuit consistency dough. I shaped it into 8 buns, and in about a 1/2 hour, I should know…. I mix it with my hands. That must have been quite a work out to do that with a spatula/spoon. I look forward to hearing how they turned out! I added some half-and-half for consistency. I live in Indianapolis, so I understand what Becky says about cheese not going creamy. I grated block cheddar and used “loose” 4 cups. This morning I made a ham sandwich for my son’s lunch with this bun. He loved the bun last night and requested a ham sandwich with this bun! I’ll let you know how he liked this new lunch! Finally, BUH-BYE, tasteless and sand-like frigging over-priced GF bun/bread! Thanks Kim! I am laughing out loud at the last line! That’s exactly how I felt. How can people buy and eat that stuff? The companies producing that stuff are making a killing as it is just rice and starch. I’d rather do without. I need make these again soon. All these ideas; BBQ chicken sandwiches, ham sandwiches for school lunches. Awesome, ladies! You know, when my 7-yo son was a only 3 month-old, I bought a small jar of Gerber banana for his first solid food. When he was introduced the first bite of that jar banana, he wouldn’t eat and just spit it out. I thought, “well, everybody said babies would do that with new foods, and it’d take 3-4 tries until baby got used to the taste.” Well, mine wouldn’t eat after 3-4 tries. I wondered why and tasted it. And, I found out why, instantly. It didn’t taste much like bananas! Since then, I had made baby foods myself. This GF bread issue reminded me of that Gerber food experience, because when my son wouldn’t eat store-bought GF bread, I tried a bite myself in frustration. Well, that was the last time I kinda made him eat that bread. I packed my cheese into the cup, and I’m thinking I shouldn’t have. My buns went sort of flat and spread out (I just plopped them on a stone to bake) and I think it may have been too much cheese. But other than being a bit too thin, they were good for dinner! I’m going to try them again with a little less cheese, I think. I’m thinking the leftovers would be really good to make Egg McMuffin style sandwiches in the morning. Slice them & toast them, and add an egg and some Canadian bacon. Mmmmmm….! Thanks so much for this recipe – and I’m also going to try your award winning bread recipe! Your story and journey sounds a lot like my family’s journey…only ours just started this past summer. I’m looking forward to trying more of the recipes here too! I am so glad it was mostly a success. Sounds like we cook/bake the same too. I am almost never able to follow a recipe as written. Great idea for the egg sandwiches. I have to tell you this talk of these buns is killing me. I don’t do well with dairy and it is getting worse as I age. So right now I am 100% dairy free. Of course now I am craving these buns and all these great ideas of ways to use them. Killing me!!! I hope you do try the bread. Have you tried many other recipes yet? I serve this bread to gluten eating guests and am told over and over how good it is. I’d love to hear your story. I love hearing about how others got diagnosed and what they do with that. How many in your family are GF? My family is pretty much gluten-free now. (except what my husband eats when he’s not at home.) My son, who’s 6 yrs. old, was sick for a whole year – his Kindergarten year, he missed so much school, I was getting letters sent home about his excessive absences. He had head colds, chest colds, bronchitis, ear infections, stomach flu, unexplained fevers, and he was very underweight….it was always something. His Dr. just kept saying it was dust mite allergies, and would put him on a different allergy med, and a different antibiotic. Everything inside me knew that this was wrong, so when he tried to put him on the 4th different allergy med, I said NO, and I found an Alternative Practitioner. In one hour, she gave us back our son. At first, he was very limited – no gluten, corn, rice, dairy, nuts, sugar, yeast…those first 8 weeks were difficult, but after that we started adding back in some different foods. Now, he is gluten/corn/refined sugar/food coloring free. Along the way, I decided it was too hard to cook one way for him and a different way for my husband and I (he’s our only child) so I started cooking gluten/corn/refined sugar free – and discovered in the process that my little guy got his food intolerances from me! Who Knew?! Incredibly, my migraines, joint pain, sinus issues, chronic bronchitis, etc…disappeared! So, this way of eating/cooking has become our way of life. I’m discovering the joys of raw honey and palm sugar, almond flour, coconut oil, whole cream-line milk, whole milk yogurt, and raw cheese (sorry about your dairy issues!). I love to cook – and was a very good non-gluten cook, so having to learn a new way of cooking/baking has been a fun challenge for me. I’ve had plenty of duds, but also some really great successes along the way! Some day – I’ll start a blog too…but right now I’m soaking it all in and learning from some of the awesome blogs out here. Your award winning bread is on the agenda for tomorrow! Oh, and the cheese rolls? I didn’t have one for breakfast (I’d already eaten yogurt with raw honey and walnuts when I remembered them!) but for lunch, I toasted one, and had some leftover sliced roast beef with a little whole grain mustard on it. SO good! SO SO good! I LOVED the bun toasted…it was a little chewy, and crunchy, and perfect with the roast beef! Thx for sharing your story. I too have been very frustrated with conventional medical doctors. There is rarely any attempt made to find the cause of the problem only a plethora of drugs to cover up the symptoms. I have now come to fear antibiotics which doctors still prescribe like candy. If 80% of our immunity comes from our GI system and the bacteria that reside there it is no wonder our kids, especially those with additional digestive issues, are constantly sick. Thank goodness that you had the spot on mommy instinct that the current choice of treatment was wrong and that you sought alternate care. Lucky for your son you aren’t one of those parents who believe doctors are like gods and are always right. My current feelings about conventional medicine put me in an uncomfortable position at work. I’m a nurse. So much of what I believe is opposite to what I have to do at work. I too have loved the challenge of learning a new way to cook. To be completely honest, if I found out today that our celiac disease was gone (which of course can’t ever happen – but hypothetically speaking here) I still would not go back to where we were 5 years ago. I don’t think wheat is good for anybody. Refined sugar, corn, food dyes, additives, preservatives etc etc etc are good for nobody except the companies that produce them. In the grand scope of life, Celiac Disease has been the best thing to happen to us. Let me know how the bread turns out! Thanks for the great conversation. This is what I love best about blogging – the opportunity to chat with people whom I would not have otherwise had the chance to meet. When you do have your blog up and going, drop me a line so I can follow it. Yay!!! I thought the same thing. The bun is better than the burger. So happy that it worked out for you. I use mozzarella in the brick not fresh. I think some of the bricks are more moist than others. I just add half and half until I get the right consistency. This is one recipe that I miss soooo bad. Me and dairy are not friends so I can’t even have this one anymore. Someone left a comment about using it for a breakfast sandwich. I thought that sounded incredible. Thank you for this wonderful recipe. It has been a LONG…. time since I had a hamburger bun. I was so stuffed after lunch, but what satisfaction!! THANK YOU! XOX! I’m so glad you liked them. Thanks for stopping by and taking the time to leave a comment. It’s great to get feedback. About the dairy. Have you tried these with Daiya cheese? I haven’t tried that. To be honest I hadn’t even thought about it. Unfortunately I was just diagnosed with a corn allergy so I can’t even try it. Daiya has xanthan gum. If you do try it please leave a comment and let me know how it turned out. I think that would work out to be a pretty pricy roll though. You would need several packages of it. Yes it would be expensive, but worth it! Can you use guar gum? My husband and I have a gluten free bake shop from our home. We just started. We sell at the farmer’s market and are in several stores. I didn’t realize til the other day that xanthan gum is made with isopropyl alcohol and can be made with corn, wheat, etc. So I was wondering about guar gum maybe instead. So was wondering what you do. We are an allergy friendly bake shop, so I want to be educated about all these different options so we can help as many people as possible! Thanks for any suggestions you have! Very cool business. I hope you do very well. Where are you located? I would so much rather buy from someone like you than any other large corporation. Yes, I can use guar gum Have you baked much with it? I tried to sub the xanthan gum in my bread recipe for the guar gum. It was the biggest kitchen fail I can remember having. I even took a picture of the bread because it was so bad and so funny. So apparently the two are very different in how they work in baked goods. I think I read that guar gum works well for things like cookies but not well for breads which is certainly what I saw. I have got to get around to posting a picture of that loaf of bread. I am grain free at this point. Coconut flour and almond flour don’t seem to need any gums at all so that’s what I am doing here. Kim- We are in Amherst VA. We started about 3 weeks ago. Been gluten free for 4 years. We have started out with baking blueberry muffins, chocolate chip cookies, and brownies. We just developed our English muffins! We keep practicing and trying to new recipes. I feel the same way, I like to buy from the little guy or girl! hee hee!! We are going to be shipping too. I am practicing shipping to a few bloggers that I frequent and a few friends. We do cupcakes and decorated cakes too! I think that is what I have missed the most. A cake from a cake shop not from a mix. So I have taken classes to learn to decorate. Then I had to figure out how to make my own recipes since many of the Wilton recipes or prepared frostings were cross contaminated or contained egg. It has been fun! We don’t do any nuts (so sadly we don’t use any almond flour.) We wanted to be totally allergy friendly and nuts are just too much of a severe allergen. This sounds great…but I all I have available is tapioca starch snd BROWN rice flour. Should I use that instead of the white? The only other flours I have are: potato starch, coconut flour, almond meal, flaxseed meal, quinoa flour. I also have chia seeds. Any other substitions I could make for the white rice flour? Thanks! Hmmm, I’m not going to be much help. Maybe someone else can chime in….I’ve never used brown rice flour or tapioca starch. I think I would give them a try though. They might be a bit more dense but they will still taste great. Kim you are the bomb! Another total hit with my daughter. She’s home and requested a hamburger, first time in a year. SO, I thought I’d try these. Of course I didn’t have a hunk of mozzarella just pre-grated so thought I’d try a half a batch with that. I warmed it in the microwave a little and it worked fine. Even the next day she was able to eat it and it didn’t crumble! Would also make great sandwich and breakfast sandwich buns! THanks! Yay! I’m so glad you tried this one. It’s one of my most popular recipes. I love it and every time I think about these buns I curse the fact that i can’t have cheese anymore. I dream of eggs benedict with this. Or a portable egg sandwich. My kids love these too. Happy to hear they were a success! I’ve been looking for a really good sandwich/hamburger roll and this one sounds much more promising than what I’ve tried so far. I read the comments, and it sounds like the most common problem was dryness and that they needed some half-n-half added to the ingredient list. Can someone recommend an amount for the half-n-half? I’m still new to gf baking, so I’m afraid to experiment with the chemistry. Thanks! Just add enough so that it sticks it together. It should feel just like a wheat dough. It’s only purpose is to make it wetter so start with a couple tablespoons and then add one at a time until it holds together but isn’t sticky wet. Good luck! I’d love to hear how they turn out for you! Tapioca starch and tapioca flour are the same thing (but potato starch and potato flour are not). I’ve made this recipe several times, sometimes using homeground white rice flour and other times storebought brown rice flour. Both were successful. Even though I live in the AZ desert, my dough is always crumbly. I’ve tried both doing the wet ingredients and adding enough flour/starch to make a good dough, and making it in the written proportions and then adding water until the correct consistency. Again, both ways work. I just made this tonight as pizza dough and it was fabulous. I used a full batch and a regular sized pizza stone, baked it for 20 minutes until the top was lightly browned. It didn’t spread, which is something I was afraid of. Added toppings and baked for another 10 minutes. The crust was fabulous, stiff enough to hold the toppings so we could eat the pizza with our hands instead of a fork. I just stumbled across your blog! I am gf, but I am also a type 1 diabetic. That being said, I watch any type of flour I use. I try to stay exclusively with almond or flax. Do you think I can use almond flour as a substitute? Well you could certainly try. It would end up a completely different thing tho. The end result would be more coarse and crumbly and possibly drier too is my guess. I also don’t think it would be a 1:1 ratio. I’ve seen recipes for almond flour biscuits. Those might be good if you added a bunch of cheese to them. If you do try this recipe with almond flour please do let me know how it turns out and how much flour you used. Can these buns be frozen? I do homemade burgers in the summer and put them in the freezer would love to have the buns as well on hand for a quick meal as we do a lot of sports summer time ! Thank you for a response if possible! Do you think this receipe would work with gluten free all purpose flour? For Onion Buns: moisten the top of each bun and sprinkle with a pinch of dehydrated onions before baking.